Nice! I have a similar one that is 40W I believe. Is the size of the envelope as big as the 40 Watts version at that era? Dave---I have a BUNCH of these 60 watt MAZDA tipped lamps, and some Hygrades, too, many NOS, and a Westy MAZDA or 10! They aren't that rare, or I just got lucky? I also have 50 watt ones, some with no tip and C-9! I also have a first generation one made circa 1912, with a larger S-25 bulb (yours is S-21, the 25 an 40 were S-19, and the 10 and 15 S-17.) and a skirted base! Yes it works, and it has the early copper support hooks. 5 over 4 layout. I likely have tipless specimens, too. I think the government wants me to smash all these up and use LED bulbs, because they are "efficient", remember! Well, they all would make a very satisfying "POP" because they are vacuum type! (MAZDA B) I think I will be the "good sheeple" and do what the libs want me to do and bust em all up and put modern LED's in my collection instead! NO? Why? They are obsolete junk and the libs say that Edison should have been locked up for foisting such junk on us, and should have made LED's in 1879! I actually saw this and it really happened! LOL what IDIOTS! Anyway, I never thought these to be an odd wattage. 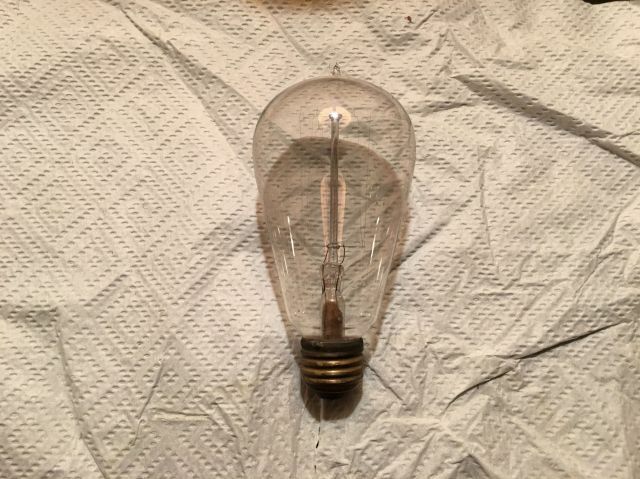 Also, 75 watts was not available until MAZDA C lamps came along after 1915, and the 75 was the smallest C lamp GE made, but I have a "One Watt" brand C class tipped lamp from the same era, that is FORTY watts! Anyway. ya better smash this and the GEM as these don't meet the boneheads at the EPA and DOE's regulations, ya know! You could be arrested and thrown in da dungeon! Rick D.
I guess the liberals think it's ok to live under blue silicon or green Tesla phosphorescent lights lololol. Anyway I have lots of those Mazdas under 60w, and I believe I have a 50w tipless somewhere. And I have two Sunbeam Mazdas from 1910 with the copper filament supports.